a) during the Renaissance Italians focused on the rediscovery of the classic art and literature: from a political viewpoint they felt a very strong allegiance to their flourishing city-states and were not attracted by the idea of reviving the Roman Empire: on the contrary they were adverse to the notion of an empire as for them this meant the Sacred Roman Empire against which they had fought for centuries. b) in the first half of the XIXth century the Italian élites turned towards the history of Republican Rome to find inspiration and support for the creation of a united country, in the form of a democratic republic. The austere conduct of the Romans was regarded as the example to follow and when the Italian patriots cited a military leader they had in mind a republican consul, rather than a despotic emperor. In 1870 the unity of Italy was almost entirely achieved, but not by a republic, as the new state (the Kingdom of Italy) was formally the result of a series of annexations by the Kingdom of Sardinia (based in Turin). The focus gradually moved towards the Roman Empire and the new state soon embarked on colonial wars. x) in 1922 in the confused and bitter years which followed WWI, Benito Mussolini became Prime Minister and was able to form a cabinet which duly gained a confidence vote in the Parliament. Three years later he managed to turn his political role into a dictatorship (Fascism), based on the cult of one man, the Duce (leader). This brought about a revival of all the military aspects of Ancient Rome to support a policy of military expansion. The day of the foundation of Rome, traditionally set on April 21, 753 BC became a public holiday dedicated to the celebration of the glories of the ancient empire. Italians did not shake hands any longer, but had to salute each other in a very military way. With WWII the farce turned into tragedy and the Italian Republic born in 1946 avoided references to Ancient Rome, because these could be regarded as references to Fascism. The 21st of April ceased to be a public holiday. The interest in the history of Ancient Rome however has never entirely disappeared and it is not restricted to Italians only. There are many associations dedicated to studying aspects of Roman life all over the world. 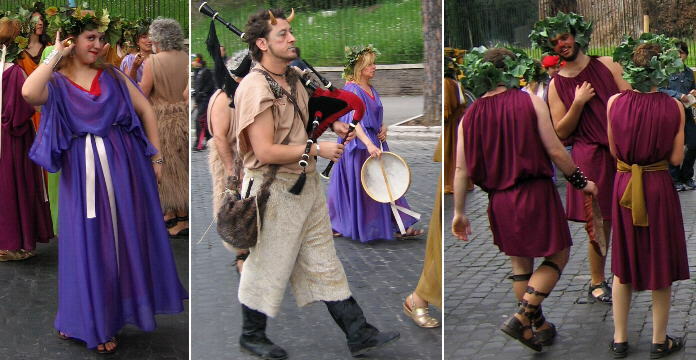 On the Sunday nearest to April 21 some of them gather in Rome for a parade from Circo Massimo to Campidoglio, via Colosseo. The history of Ancient Rome spans more than 1,000 years without taking into account the Eastern Roman Empire, and obviously military structures, weapons and uniforms varied a lot during this period. We have little documentation of how the Romans fought in their early expansion in Central Italy; by winning the Punic Wars (264-146 BC) against Carthage, Rome became the leading power in the western Mediterranean Sea and from that time onwards we have a relatively clear understanding of the Roman Army and Navy. For the following centuries, in addition to accounts, we can rely on an impressive iconographical documentation having its peak in Colonna Trajana describing the two wars Trajan fought in today's Romania. Discipline and sense of belonging are key elements to the success of any army. The Roman Army was structured into legions each of them manned by some 4 to 6,000 infantrymen, plus cavalry and auxiliary corps. Each legion was known by a sequential number and a name: the number was engraved in the insignia (ensign) of the legion. The loss of the insignia was regarded as a tragedy and the soldiers did all that they could to prevent it. Shame and ill omen were associated with this event. The numbers of the three legions (XVII, XVIII, XIX) destroyed by the Germans in 9 AD were never attributed to other legions. Augustus regarded as one of his main achievements the recovery from the Parthians (in 20 AD) of the insignia lost by the Romans more than 70 years before at Carrhae. This episode is shown on the armour of his statue found at Prima Porta. Each legion was divided into ten cohorts, having their own vexillum (standard). The vexilifer who was in charge of bearing the standard had no other weapons than the skin of a wild beast to protect himself, as a novel Hercules. These standards were not just tools to boost the morale of the troops, but they provided both commanders and soldiers with useful reference points during the fight. The belly of the leader of the group shown in the image above is the unmistakable effect of a beer addiction. The long trousers also suggest the German origin of this group. Next to the leader we can see a horn blower, a very important element in the chain of command, as he transmitted the key orders during the fight. The Romans also blew into shells to obtain a loud sound, very much as we can see in Bernini's Fontana del Tritone. The key weapon used by the Roman infantrymen was a short sword, with a tapered point, called gladius (after which gladiator). Roman soldiers extensively trained in hand-to-hand fighting in Campo Marzio and this was for centuries the strongest point of the Roman army. In the first Punic war (264-241) the Romans for the first time were compelled to fight at sea against the much more skilled Carthaginian seamen. To overcome this handicap the Roman consuls devised some light bridges having at the end hooks which were thrown upon the enemy's ships, thus allowing the Roman soldiers to move across them and fight on the decks in the way they knew best. In a battle hand-to-hand fighting comes at the end of several phases during which the two armies progressively get closer. To resist the attacks of the cavalry, which often constituted the main part of the enemy's forces in Asia and Africa, the Romans had lances which stopped the impetus of the horses or javelins which were thrown at the horsemen. The Romans made very little use of archers, they were rather more skilled at slinging stones, but often their enemies, especially the Parthians, were very effective in the use of these weapons. The Romans devised a particular way of marching called testudo (turtle). This required the perfect execution of a series of orders on how to hold specially designed shields in order to protect all the members of the cohort from the falling arrows, and at the same allow the soldiers to move on. The movie "The Gladiator" with Russell Crowe has given worldwide publicity to the Colosseum and to the fights which were arranged there to entertain the Romans. As a result there are now some 50 lads earning their living by being photographed next to a tourist in a more or less appropriate gladiator attire. Very often they wear costumes coming from Cinecittà, the Italian studios in the outskirts of Rome, which are not faithful copies of the originals portrayed in mosaics and reliefs. 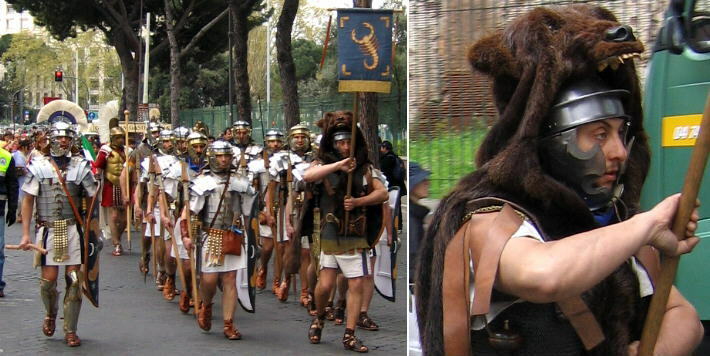 Some of the groups participating in the April 21st parade included gladiators showing the protections which made the fights less bloody and dangerous than generally thought. Another kind of fight the Romans liked very much was that between two retiari or between one of them and a wild beast. They were dressed like a sort of Neptune and used a net (rete, hence their name) to trap their opponent. Not all the groups focus on recreating military aspects of the Roman Empire. The Emperor Augustus celebrated the peace that he had established within the Empire by building a monumental altar covered with reliefs showing religious processions and ritual sacrifices. These reliefs provide together with a vast iconography from other sources the reference for understanding how the Romans were dressed when they were not at war. Those who wanted to be appointed to a public position, had to wear a toga candida a white (candidus) loose garment: that's why we call candidate one who seeks appointment to an office. Finally some groups focus on how the Romans enjoyed themselves and here again there are many iconographical sources telling us what happened during the Bacchanalia, the festival of Bacchus or the Saturnalia, the festival of Saturn, a time of unrestrained merry-making extended to the slaves. The image used as a background for this page shows a personification of Rome as it can be seen in a statue in Piazza del Campidoglio.